Included are some things on the Saint's life. which I believe have been somewhat forgotten! there's quite a bit here, enjoy! there's also some advice from St. Dimitri about time! 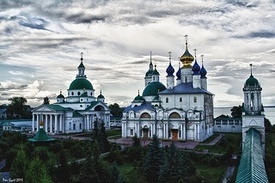 Holy Hierarch St. Dimitri was born in 1651 in the settlement of Makarov, within the confines of Kiev. At his Baptism, he was given the name Daniel. His father Savva, also known as Tuptalo, was a regimental centurion [i.e. lieutenant]. Daniel enrolled in a school in Kiev, and from his early youth manifested great zeal dedication to prayer and study, preferring reading books and listening to pious conversations, over playing noisy games with his companions. Over the years, this only intensified, and at the age of 17, with his father’s blessing, he entered monastic life at the St. Kirill Monastery. There, as he became ever more resolute in faith and piety, Dimitri (the name he was given at his tonsure), also assiduously continued with his studies, and learned a number of languages. Possessing God-given intellect and talents, he used the gifts given him by the Lord for good, and like the faithful servant spoken of in the Gospels, he multiplied the talent entrusted to him, using it in the service of God and for the benefit of his neighbor. He preached the Word of God in Kiev, Chernigov, and in various monasteries, was an abbot at the Maksakov and later the Baturin Monasteries. His sermons attracted a multitude of listeners, and buttressed Orthodoxy in regions where close and frequent interaction between the local populace and the neighboring Papists had caused it to waver somewhat. Soon Dimitri was called to perform a different labor. 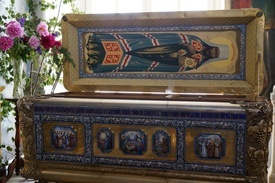 There was a need to assemble a collection of the Lives of the Saints. Metropolitan Makary had long since begun the task of collecting the Lives of Saints from various sources and assembling them in his great volumes of the Menaion. Later, Metropolitan Peter Mogila of Kiev expressed the desire to publish them in language more accessible to all. However, he died before he could accomplish his goal. Now the Metropolitan of Kiev was looking for someone to whom he could entrust that task. He settled on Dimitri, who was already renowned for his piety, erudition, and industriousness. Dimitri began this useful work while he was abbot of the Baturin Monastery, and gradually worked on it over the course of 20 years – as Archimandrite in Chernigov and in Novgorod of the North, and then as Metropolitan of Rostov. In that Menaion, he assembled the lives of the Saints for each day of the year, a task for which we owe him a profound debt of gratitude. Meanwhile, Peter, the reigning Emperor of Russia appointed Dimitri to be Metropolitan of Siberia and Tobolsk. However, the Hierarch’s poor state of health, as well as the task he had undertaken, prevented him from setting out on the long journey to Siberia. Accordingly, he was reassigned, to be Metropolitan of Rostov and Yaroslavl. Remembering the Savior’s statement that of one to whom much is given, much will be required, Dimitri in his new exalted rank, he worked even more assiduously to care unstintingly for those entrusted to his care. He used his own funds to build a school in Rostov, oversaw the class work, and when his complex schedule of activities permitted., often taught there himself. He tirelessly strove to explain Christ’s teaching through lectures and homilies, and set a good example by his temperate, God-fearing, and honest way of life. A person who was kind, compassionate, and accessible to all, he helped his neighbor by all means possible. He would eagerly impart advice and instruction, would visit the sick, and would be generous with gifts of food and clothing to the needy, keeping almost nothing for himself. Thus, at his death, he left nothing but his holy books. 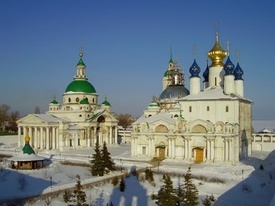 On account of those spiritual labors, the Holy Church glorifies him, calling him a zealot for Orthodoxy, rooter-out of schism, the Russian star that shone forth from Kiev and shone through Novgorod of the North, came to Rostov: a man of golden oratory, a teacher who through his teachings and miracles enlightened the entire land. Death came to the Holy Hierarch at an early age. In his 58th year he fell ill and, although the illness did not appear to be serious, and did not worry anyone else, he sensed that his end was near. On the eve of his death, he called together his choir, and attentively listened as they sang his own composition, “I place my hope in God, Thou my God, Jesus, Thou art my joy.” He dismissed all but one of the chanters – who had assisted him in transcribing his compositions. For a long time, he talked to him about life, and about the responsibilities attendant to being a Christian. Then he dismissed him as well. Escorting him to the door, St. Dimitri bowed low before him, and thanked him for all of his service. The chanter said, “Holy master, [why] are you making such a profoundly deep prostration before me, the least of servants? The Metropolitan again made a prostration, and repeated, “I thank you.” Then he knelt in prayer. The chanter returned home with a sense of mournful premonition. Early in the morning, the tolling of the bell announced the passing of the Holy Hierarch who was found dead, still kneeling in prayer. This occurred in Rostov in 1709. 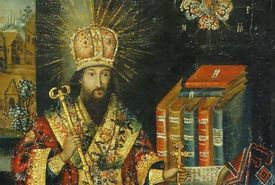 Years later, the Holy Hierarch’s honorable relics and his vestments were found to be incorrupt, and in 1763, at the direction of Empress Catherine, were transferred to a silver reliquary. Since that time, a multitude of faithful have come from all over Russia to Rostov in order to bow down before the relics of the great Holy Hierarch, St Dimitri, Metropolitan of Rostov and Yaroslavl. From the times of the Apostles, Christians of all ages, when entering upon a task, began it with prayer, and the end of it they also hallowed with prayerful thanksgiving to the Lord, in Whom we live and move and have our being. And let us do the same, beloved reader. But not having the gift of effectual prayer, let us recall and commit to memory what once was offered to the Lord by the grace of the Holy Spirit out of the inspired heart of the great Russian man of prayer, our father among the Saints, Dimitri, Metropolitan of Rostov and Yaroslav. I am sure that for you, as for me, in offering to your attention "The Tale of the Five Prayers" the work of the great Bishop, it will be both welcome and useful, especially in the view of the wonderful promises which it contains. So hear this tale, my beloved reader. One of the holy fathers, standing in prayer and being in ecstasy, heard the voice of our Lord Jesus Christ speaking to the Immaculate and Holy Mother of God, His Mother, saying to her: "Tell me, My Mother, which were the greatest of your sufferings, when you lived in the world, which you suffered for My sake?" The Immaculate One replied: "My Son and God, five times I have endured my greatest suffering for you: First, when I heard from the Prophet Simeon that you were to be killed; Second, when I looked for you in Jerusalem, and did not see you for three days; Third, when I heard that you were seized and bound by the Jews; Fourth, when I saw you on the Cross crucified between the robbers; Fifth, when I saw you placed in the Tomb." And the Lord said to her: "I tell you. My Mother, whoever reads every day each of your sufferings with My prayer, i.e. 'Our Father,' for the first suffering I will give the knowledge of his sins and sorrow for them; for the second, I will give the forgiveness of all his sins; for the third, I will restore to him the virtues lost through sin; for the fourth, I will refresh him at death with my Divine Body and Blood; for the fifth, I will appear to him Myself at his death, and receive his soul into eternal life. Amen." "Glory to Thee, Christ my God, that Thou hast not destroyed me a sinner, with my sins, but even till now hast borne -with my sin." “Vouchsafe, O Lord, to keep me this day without sin. Grant, O Lord, that I may not anger Thee, my Creator, in thought, word or deed, but that all my actions, counsels and thoughts may be to the glory of Thy Holy Name." "God be merciful to me, a sinner, throughout my whole life. In my passing and after death, forsake me not." "Lord, Jesus Christ, Son of God, accept me, dead in mind and soul, accept me, a sinful prodigal, impure in soul and body. Take from me all shameless enmity and resistance, and turn not Thy Face from me, O Lord, nor say: I know not who thou art. But hear the voice of my prayer: save me, for Thou hast a wealth of compassion and desirest not the death of a sinner. I will never leave Thee nor depart from Thee, my Creator, till Thou hearest me and givest me forgiveness of all my sins, through the prayers of Thy Most Pure Mother, the intercession of the honourable Bodiless Powers of Heaven, of my holy and glorious Guardian Angel, of Thy Forerunner and Prophet, the Baptist John, of the God-speaking Apostles, of the holy and victorious martyrs, of our Venerable and God-bearing fathers, and all Thy Saints, have mercy and save me, a sinner." “Virgin Mother of God, rejoice, Mary full of grace; the Lord is with thee. "O merciful Mother, Virgin Mary, I thy sinful and unprofitable servant, remembering thy suffering on hearing from the Prophet Simeon of the merciless murder of thy Son, our Lord Jesus Christ, offer thee this prayer and the Angelic Salutation. Accept it in honour and memory of thy suffering, and pray thy Son, our Lord Jesus Christ, to grant me the knowledge of my sins and sorrow for them." The Trisagion through the "Our Father...."
"O Divinely-blessed and Immaculate Maiden, Mother and Virgin, accept from me, thy sinful and unprofitable servant, this prayer and the Angelic Salutation, in honour and memory of thy suffering when thou didst lose thy Son our Lord Jesus Christ, in the Temple, and for three days didst not see Him. Pray and beg of Him the forgiveness and remission of all my sins, O only Blessed One." "O Mother of Light, most blessed Virgin Mother of God, accept from me, thy sinful and unprofitable servant, this prayer and the Angelic Salutation, in honour and memory of thy suffering on hearing that thy Son, our Lord Jesus Christ, had been seized and bound. Pray Him to restore to me the virtues lost through sin, that I may magnify thee, O Most Pure One, for ever." "O Fountain of Mercy, Virgin Mother of God, accept from me, thy sinful and unprofitable servant, this prayer and the Angelic Salutation, in honour and memory of thy suffering when thou didst see thy GOD, our Lord Jesus Christ, on gift of His mercy in the hour of my death, and to refresh me with His Divine Body and Blood, that I may glorify thee, my Defender, for ever." "O my Hope, Most Pure Virgin, Mother of God, accept from me, thy sinful and unprofitable servant, this prayer and the Angelic Salutation, in honour and memory of thy suffering when thou didst see thy Son, our Lord Jesus Christ, placed in the Tomb. Pray Him, O Lady, to appear to me in the hour of my death, and to receive my soul into eternal life. Amen." In the life of Saint Dimitri of Rostov, as told in Blessed Bishop Nicolai Velimirovic's Prologue, we can read that the saint was in the salvific habit of chanting the hymn "O Theotokos and Virgin, Rejoice" every hour when the clock struck. Of course, he was a monk and even a saint. He lived in a monastery, and led a life dedicated to prayer and the learning and keeping of God's commandments. We poor ones lead a life most often not dedicated to those things which are for the salvation of our souls, but to the cares of this world and self-gratification, even though the evangelical commandments, which St. Dimitri followed so well, apply to all Christians. We engage in both important and frivolous pursuits, and are often surrounded by people using bad language, and with bad ideas. Everywhere, whether in the office or supermarket, among our families, friends and brethren, or even when alone, temptations, distractions and sinful images assault us. It is very easy to forget WHO WE ARE (that is, who we have as our Father), and to lose a sure knowledge of the presence of God within our hearts as we go about our tasks. Perhaps we say our morning and evening prayers faithfully (perhaps not), but we may go long periods during the day that we do not remember God, or pray even a little bit. To always have the remembrance of God within us is certainly beyond our capabilities for the moment, but we can make a good start by emulating Saint Dimitri's good habit. Christian! Strive to remember God at least every hour. Purchase a watch which beeps every hour, or a clock with chimes. Decide upon a short prayer or prayers to say every hour. Perhaps you may say "Meet it is," or the Jesus prayer, "Lord Jesus Christ, Son of God, have mercy on me, a sinner," or the prayer of the publican "O God be merciful to me a sinner and cleanse me." You may merely cross yourself and call God to mind. The content or variety of prayers is not so important, and is a matter of personal preference. The important idea here is to somehow shake ourselves out of our lethargy at least every hour, so that we do not forget God. If you observe this practice faithfully, you will begin to see almost immediate results. You will find yourself praying more often, and able to listen to the prompting of your guardian angel, who previously could not be heard above the din. You may notice with unnerving frequency that you were about to be angry or were gossiping, or about to be mastered by some other passion as the clock strikes. If that is the case, then, you have an opportunity to immediately turn to God, and ask forgiveness, then say "your prayer." It is a much better thing to remember God while sinning, and to turn back to Him, than to keep on sinning and not think about Him. ...from a museum in the Ukraine. "Open, O doors and bolts of my heart, that Christ the King of Glory may enter! Sit on the throne of my heart and reign in me alone, O Thou, my King and Lord." "With such good thoughts partake of the Divine Mysteries"
often referred to simply as “Dimitri Rostovsky”…. was a great 17th century heirarch, preacher, author and ascetic. The Church commemorates the finding of St. Dimitri's miracle working relics on October 4th/ September 21st, discovered in 1752. His repose is commemorated on November 10th/ October 28th.He is also commemorated on June 6th/ May 23rd, along with the Synaxis of the Saints of Rostov. He was canonized in 1757 on the 22ndof April. He was born Daniil Savvich Tuptalo (or Tuptalenko, according to some sources) in the Makarovo region, near Kiev into a Cossack family in 1651. Soon thereafter his family moved to Kiev and he entered the Kievo-Mohyla Academy at the age of 11. 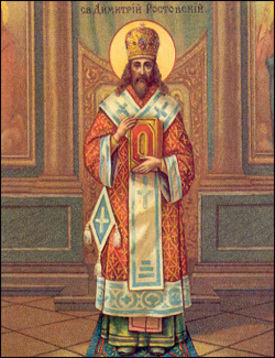 On 9thof July 1668 he took his monastic vows at St. Cyril's Monastery in Kiev and was given the monastic name of Dimitri (after St. Demetrius of Thessaloniki.) 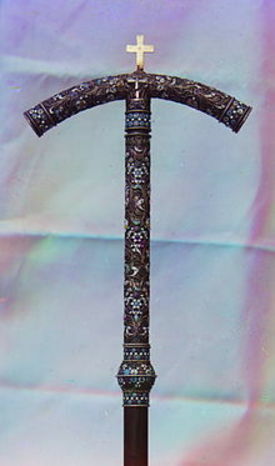 After a brief period in Chernigov, Dimitri went to venerate the Byzantine Slavic Christian Shrines if Belorus, which was still located in the Polish-Lithuanian Commonwealth at that time. 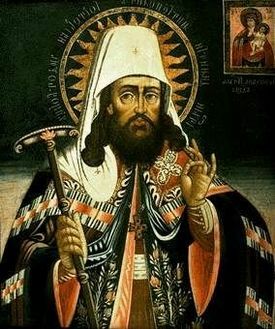 In 1678 he returned from Vilno and during the 1680s, Dimitri lived mostly at the Kiev Caves Lavra while his sermons against hard drinking and lax morals made his name known all over Russia. 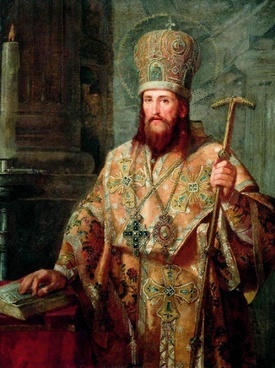 He was appointed the abbott (superior) of several major monasteries in the Ukraine, but concentrated his attention upon the ambitious project of integrating all the lives of Russian saints into a single work, which he published as Monthly Readings (Четьи-минеи) or Menalogion in 1684-1705. 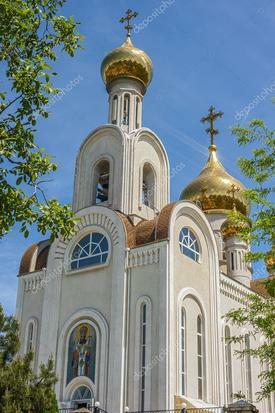 He also found time to study ecclesiastical history of the Russian Orthodox Church. 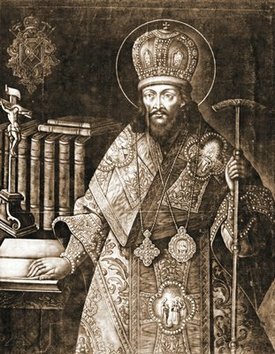 In 1701 St. Dimitri was appointed Metropolitan of Siberia, but, pleading ill health, preferred to stay in Moscow, until he was invested with the archbishopric of Rostov. During his life in Russia, Dimitri opposed both the Old Believer’s and Peter the Great’s ecclesiastical policies. He also made invaluable contributions to the Russian education, opening a school and a small theatre in Rostov, where his own plays could be staged. Among his many glorious works of instruction, he was known especially for his translation and publication of The Lives of the Saints. He foresaw his own death three days in advance, and died while at prayer. 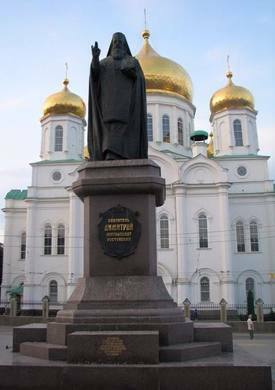 Dimitri was a great light of the Russian Church - and of Orthodoxy in general. He had heavenly visions during his life. He served the Lord zealously and took up his habitation in the Kingdom of Heaven. 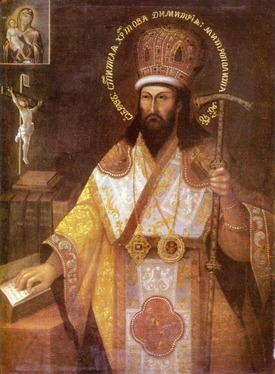 St. Dimitri was a leading opponent of the Caesaro-papist reform of the Russian Orthodox Church promoted by Feofan Prokopovich. 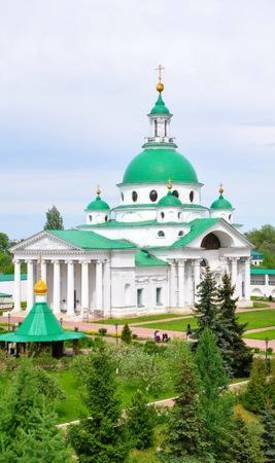 He is representative of the strong Ukrainian influence upon the Russian Orthodox Church at the turn of the 17th and 18th centuries. St. Dimitri also composed a service to the Nine Martyrs of Cycizus, in which he wrote "through the intercession of these saints, abundant grace was given to dispel fevers and trembling sicknesses." St. Dimitri also described the sufferings of the holy martyrs and wrote a sermon for their feast day. 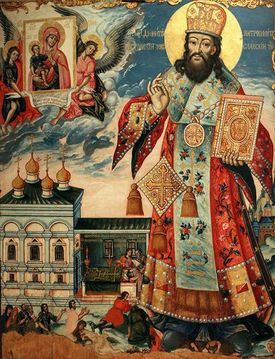 St. Dimitri was also active as a composer, although his musical education is undocumented. Aside from the standard music curriculum established by Feofan Prokopovich at the Kiev-Mohyla Academy. 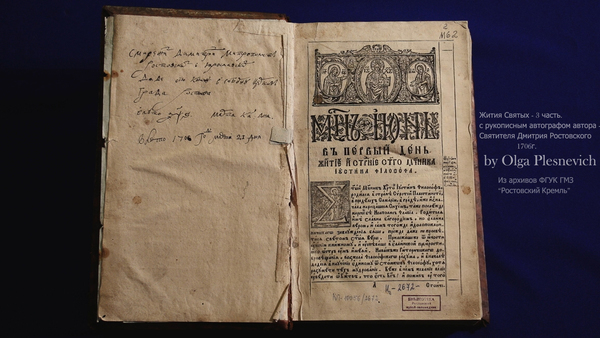 Many of St. Dimitri’s Penitential Psalms achieved wide circulation, not only in the Ukraine but in the Balkans too. He is separately credited as composer or compiler of the first Russian Opera, the six-hour-long Rostov Mysteriesof 1705, which may best be judged an oratorio on the lives of Russian saints. Its basis is the "Cheti-Minei" (Четьи-Минеи), published in four volumes in 1689, 1690, 1700 and 1705 the same source that inspired Pushkin in 1825 to write Boris Godunov. 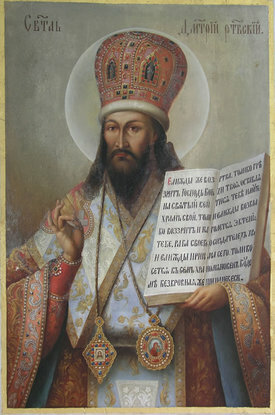 Metropolitan Dimitri reposed in the year 1709, on October 28. His relics were found in 1752 and were placed at St. Jacob's Monastery, which his followers would rebuild as a memorial to him. 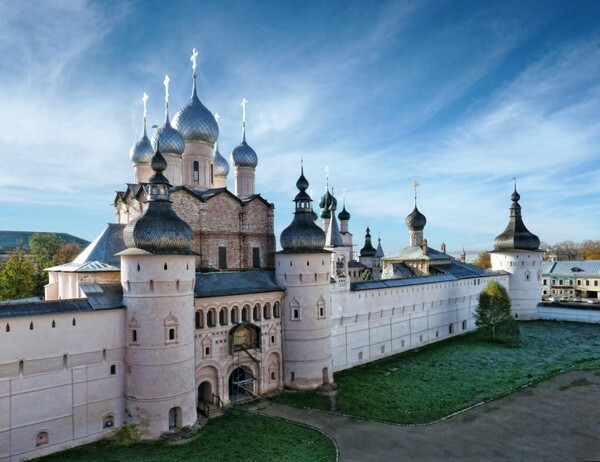 A fortress on the Don River was named after him; today it is known as Rostov-on-the-Don.